Performance 2.0 Storage Cabinets in Blue (8-Piece Set) Get your power tools, seasonal decorations, gardening supplies and more organized with the Performance 2.0 Series cabinet system. With durable 24-gauge steel frames and strong double-walled doors, these cabinets are built to last, and they're fully-lockable, so you can rest easy knowing your valuables are safe.Easy-to-grab stainless steel handles give quick access to your items, and a frameless door design provides a clean, contemporary look to your space, with height-adjustable legs to accommodate for uneven garage floors.Flip-up style doors on the Wall Cabinets allow for a wider opening for retrieving paint supplies, and cleaning items, while adjustable steel shelves in the Locker and Base cabinets give you a customizable storage solution, with plenty of room for all your belongings.Durable steel cabinets, great for any space. With the Performance 2.0 Series Garage Cabinets, your home just got a lot more functional. 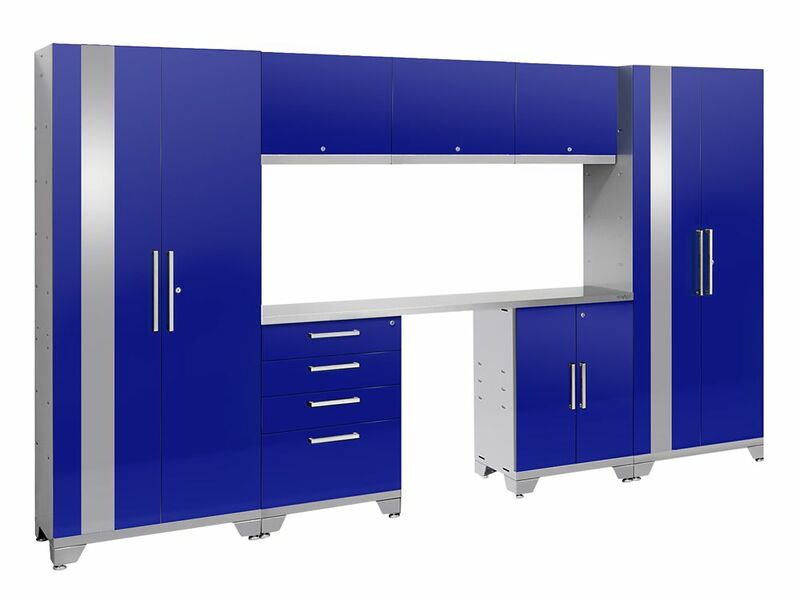 Performance 2.0 Storage Cabinets in Blue (8-Piece Set) is rated 5.0 out of 5 by 1.